Political musings of an interested but non-expert citizen. Following on from the review of Dáil boundaries last year, a committee has been set up to redraw county and city council wards. They accepted public submissions during January and here is the one I wrote. It wasn't as detailed as I wished as I ended up rushing it in the last couple of days while travelling to and from Brussels. With an increase in representation from 52 to 63 councillors, each councillor will now represent 8375 residents, based on the latest population figures from the CSO. Despite the improvment since the last review, this still leaves Dubliners under-represented by almost 43% compared to the rest of the country. If the figure used in other councils was applied to Dublin, there would be 109 councillors for the City. This would allow the committee to provide real local representation by creating smaller geographical wards, not sprawling semi-Dáil constituencies that it is now forced to do. I note in the terms of reference that wards are to return between 6 and 10 members. This is a very welcome requirement. For proportionality’s sake, it is important to move away from 3 and 4 seaters. Indeed my submission to the Dáil boundary review proposed a scenario where most TDs were returned in 5 seaters. The second important principle in drawing boundaries is to try to keep natural communities in a single ward. In the current arrangement urban villages like Terenure, Raheny and Sandymount are split across two different wards and this is less than satisfactory. However, given the often competing pressure to define clear boundaries following main roads, rivers, railways etc. it is probably not possible to adhere to this principle at all times. The final principle is that, where possible, Council and Dáil boundaries should coincide. Again, it is not possible to satisfy this constraint at all times. The population in the City area south of the river Liffey is approximately 220k. This suggests a representation level of 26 councillors. Looking first at the new Dublin Bay South (DBS) constituency, the population there is almost perfect for 14 councillors so I propose the creation of two wards entirely contained within that Dáil constituency, each of 7 seats. Drawing a border that follows the canal from Harold’s Cross to Leeson St and then along the N11 to the Council boundary with Dún Laoghaire, creates two wards as required. These are effectively a merge of the old Pembroke and South East Inner City wards (Pembroke) and old Rathmines merged with the areas of Terenure and Harold’s Cross that were recently moved from Dublin South Central (Rathmines). 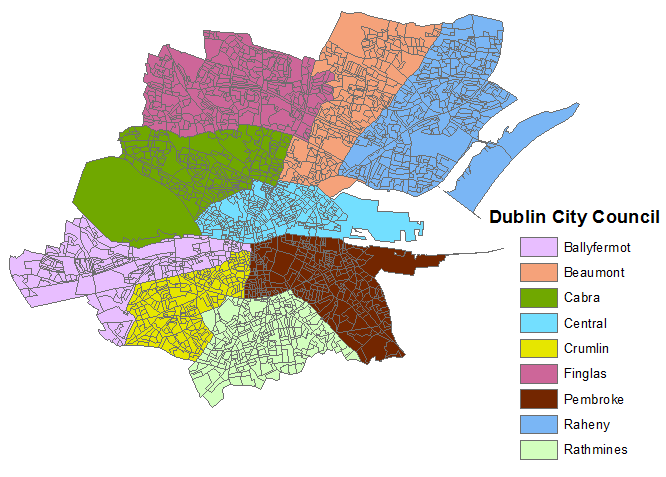 The remainder of the south side all lies within the Dáil constituency of Dublin South Central (DSC). I have also included the part of DSC that lies north of the river along Parkgate St and Conyngham Road. This population merits 12 councillors and so I propose creating two wards of 6 seats. This division is not as simple as the one for DBS. The difficulty stems from the fact that the Merchants Quay and Ushers DEDs are far more densely populated than the outer suburban areas. I have tried various combinations of DEDs, none to any great satisfaction – one either ends up splitting the inner city or Crumlin, or else ends up with a sprawling outer ward that stretches from Chapelizod to the KCR. This boundary follows Thomas St, Marrowbone Lane, LUAS tracks, the Camac and finally Walkinstown Rd to the roundabout. The eastern part I call Crumlin and the western part Ballyfermot. Moving across the river, there are 37 council seats to be allocated. The area is covered by 4 Dáil constituencies, Dublin Central (DC), Dublin West (DW), Dublin North West (DNW) and the new Dublin Bay North (DBN) with only DC entirely within the City Council area. Starting with DC, the population merits a total of over 10 councillors. If one removes the Cabra DEDs, one is left with a Central ward with population requiring 8 councillors. DBN’s population entitles it to be represented by 15 councillors. Previous local divisions have split the village of Raheny, so I propose instead to divide the constituency in half using the Malahide Road, a natural boundary, with the eastern portion (Raheny) allocated 8 councillors and the western (Beaumont) awarded 7. DNW has recently been extended to include the Botanic DEDs as well as Drumcondra South C. If these areas are excluded, the remaining territory has exactly the right population for an 8 seat (Finglas) ward. The remaining areas, namely Cabra from DC, Botanic and Drumcondra from DNW and the Ashtown & Phoenix Park areas in DW can be merged into a single 6 seater (Cabra). The map below shows the arrangement of the wards as outlined above. The names are not to be taken as definitive in any sense. Finglas could just as easily be called Ballymun and Ballyfermot could be Inchicore. Final place names should probably be agreed by the committee in consultation with the existing public representative from the area concerned. This post has been written in 4 goes, each time adding a new bit to the end as things change. Sorry about the lack of coherent style. According to the movies, it is that amazing time in every teenagers life. The dorky boy asks the shy girl to the dance, they both turn into beautiful swans and the cheerleader falls into the punch bowl in a fight with her quarterback boyfriend. Prom night - it's awesome. Except in Ireland when it refers to the overnight emergency legislation to appoint a liquidator to IBRC, that wonder financial institution that used to be called Anglo. I got home last night just in time to watch the stage 2 "debate" in the Dáil and ended up not getting to bed until the committee stage was complete and the bill went down the corridor and up the stairs to the Seanad. While it may not have been high drama, you certainly got the feeling at times that you were watching something important. I'm not going to go into the details of the IBRC bill, as there are many more qualified finance and legal people out there. However I do want to make some observations about the events. The biggest question is why did it happen last night? Well it seems as though our friends in the ECB couldn't keep their gobs shut and let it out that the Government might be about to liquidate IBRC. With so many other creditors, it became crucial that we got to appoint the liquidator rather than have an application heard from, say, Sean Quinn in the High Court this morning appointing a liquidator more amenable to him. So in that sense the government got the tactics right and just played the nuclear option of emergency legislation. But it does question how good friends we really have in Frankfurt. Another surprise to me was the length and detail of the bill. This has obviously been sitting in a drawer for a while waiting to be dusted off at the right time. You can't announce a liquidation until it is already happening, otherwise people will panic and run to the hills or courts. But the fact that it hadn't leaked from Dept of Finance or AG's office is testament to the tight ship being run there at the highest levels. On the debate itself, Noonan, Doherty and Donnelly all performed well. Poor contributions from both Taoiseach and Tánaiste and some pretty awful stuff from parts of the technical group. On that, the technical group would actually have been best served by giving all their time to Donnelly as he has the best grasp on the issue and some really pertinent questions and lines of attack on the bill. For example the issue of temporary interference with the property rights of people is a potential pandora's box. This seemed an unacceptable idea when it came to upward only rent reviews but now seems to be fair game. The worst part of the debate was the continued heckling and jeering at both Sinn Féin speakers by senior members of the government side. Both Pat Rabbitte and Brendan Howlin did themselves no favours by their carry on. I found it quite embarrassing that seemingly intelligent ministers resorted to school yard behavior just because they didn't like what was being said across the chamber. Then at lunchtime today we had Mario Draghi's non event of a press conference. In his 15 minute speech he didn't mention Ireland or the Pro Notes once. When asked about them he just said that the council had unanimously noted the events in Ireland. I guess that means tacit approval because the deal still lets the ECB get all it's money back, just quicker than they thought. I missed Enda's announcement as I was in a meeting this afternoon, but the deal seems to be a reasonable one. We get to turn the pro-notes and their 3.1B every year into an interest only loan at about 4% for 25 years and then start paying down the capital. This reduces our annual cost by over a billion and we get the benefit of 25 years of inflation to turn the capital sum into something a bit less daunting. It is still really annoying that we have crystallized privately generate debt into fully fledged sovereign debt and that not a single bondholder has been burned. But given all that, it's probably as good a deal as we can expect. It will certainly make next December's budget easier and/or allow for additional investment in growth strategies. I'll let the dust settle now and come back to this in a day or so once things are clearer. Since we last mentioned abortion things have come a long way. The death of Savita Halappanavar, the ensuing vigils and protests, the leaking and publishing of the expert report, the reintroduction of Clare Daly's bill and the three days of public hearings by the Health Committee of the Oireachtas have all put abortion back at the heart of Irish politics. So much has happened and been commented upon that I'm not going to rehash old news but I do want to make a few comments on the Oireachtas hearings that have been held over the last three days. Despite being in work this week, I managed, thanks to the HEAnet stream, to keep up with most of the proceedings in the Seanad chamber. From a bill drafting and parliamentary politics point of view, I feel that the public consultation was a bit of a waste of time. Despite James Reilly saying the contributions from the witnesses would feed into the process, I really get the feeling it was all a bit of a show to let the various groups feel like they had their day out. That said, what the sessions did show is that is is possible to have a discussion about abortion without degenerating into school-yard name calling and bullying within a few minutes. Much of the praise for that must go to Jerry Buttimer who ran a tight ship as chair of the committee. But also a certain amount of begrudging respect must be shown to the TDs and Senators, especially over the course of the first two days who participated in a dignified and thoughtful way to the debate, Billy Kelleher and Caoimhghín Ó Caoláin in particular. The first two days, consisting of medical and legal opinion was pretty straight forward. I did learn that there are about 30abortions carried out in Ireland every year and that fatal foetal abnormalities could potentially be terminated according to the definition of life in the Constitution and Supreme Court judgements. I particularly enjoyed the session with William Binchy and Catherine McGuinness which consisted of a lot of mutual respect but also pretty direct disagreement between the two witnesses. Day three, featuring religious and other advocacy groups was always going to be the most pointless and divisive and thus it proved. Yet again the protestant churches came out looking the best, with the strongly entrenched position of the Catholic church looking more and more out of touch with the general population. I was a little amused to catch a glimpse of Ronan Mullen in the camera shot while the representative of the Muslim community was quoting from scriptures. Mullen didn't seem to be too impressed. As usual, Mick Nugent of Atheist Ireland went in a bit too aggressive for my liking but I guess that's just his style. Having long debates with the pro-life and pro-choice advocates was an even bigger waste of time. Everyone knows exactly where each group stands on the issue and all it provided was an opportunity for some snide remarks and loaded questions from all sides. Particularly unpleasant were the contributions of Terrance Flanagan and Fidelma Healy Eames in the final session. So now that's out of the way, we have to sit back and wait for a bill to be drafted. Luckily one witness, Dr Simon Mills, has already done the hard work and submitted a draft bill to the committee for their consideration. I imagine the issue will be let lie for a while as the EU presidency gets up and running but we should see some further movement in about March I reckon. We could still have a new law signed by the summer recess bringing some closure to 20 years of X.
PS - I'm waiting for the transcript before discussing the issue of gender selection that was brought up in the final session. I missed hearing the details at the time and have only seen the comments on Twitter. The budget last week has been rightly called the worst austerity budget yet. There are so many odious measures in the proposals that have either not been considered properly from an equality and anti-poverty perspective or the alternative, which is even worse, is that conscious choices were made by Fine Gael and Labour to further punish those on low incomes. I would like to believe the Bonaparte statement applies in this case: "never attribute to malice what can be explained by incompetence" but my fears are that this budget is very much the result of planing by Government. Top of my list of awful measures is the cut to the carers respite grant. Of all the people society should be supporting, those who look after the sick, disabled and terminally ill are amongst the most important. The measure of a civilized society is in how it looks after the most vulnerable, and if we don't properly support those who care for the most vulnerable with suitable breaks and respite, then we are effectively punishing the recipients of this care. For an overall saving of around €25M this measure can only be seen as cruel and miserly. Next on my hitlist is the removal of the PRSI allowance. Any measure which impacts identically on people who earn €20k and €200k is not fair by any measure. Lower income earners feel the loss of €5 per week a lot more than higher earners. It can be the difference between putting on the heat in the morning and sending the kids to school from a cold house. For better off people (me included) it is the choice of not having an extra pint on a Friday night in the pub. The introduction of a property tax is to be welcomed but yet again the government have made the wrong choice in the matter. Instead of a site-value tax which encourages efficient use of zoned land, they have gone for a property-value tax. Now when a homeowner invests in double-glazing, an extension or an attic conversion for their home, the have the dubious benefit of increasing their tax liability for all eternity. The property-value tax also has no impact on zoned but unused land. A site-value tax would encourage this land to be developed or rezoned back to non-development status. Instead we still have massive land bank, zoned for residential use, that sit idle waiting for the next boom. I guess most of those are in the ownership of FG voters. Other measures that are wrong in my view are the cut to child benefit (should be taxed instead), further increases in DIRT (shouldn't we be encouraging saving? ), increase in the student charge at 3rd level (the funding of the whole sector needs to be reviewed) and the reduction in the time period in which jobseekers benefit is given. I'm no economist, but even I can see that the net effect of this budget is further hardship for those at the bottom with those nearer the top getting away pretty lightly. I'm part of a pretty well paid, double-income, single kid, negative equity household and we could definitely afford to have been squeezed a good bit more. Over the course of the recession our lifestyle has changed (fewer pub nights) and our expenses have increased (child care) but we still have enough to get by on quite comfortably. It is not true to say that everyone is feeling the pain equally. Those at the bottom, whose voices tend not to get heard are being punished the most. This is something that Labour should not be tolerating, let alone being complicit in. Our leadership has failed the membership and those who voted for them. It is time now for the party to take a long hard look at our continued participation in this government. It is clear that our views and policies are being ignored by Fine Gael and it might be best for everyone if they were let run the place as they see fit. Yes, an election in February/March would destroy the parliamentary party and probably see an FG minority govt propped up by Fianna Fail, but it is about the only honest way forward for a Labour Party that has betrayed so many people. In the future, voting no to coalition in the O'Reilly Hall will be like having been in the GPO on Easter Monday. Everyone will claim to have been part of that faction. Well I was one and at the time I accepted the will of the majority (85%) of the delegates and adopted a wait and see attitude. Now it is clear that our greatest fears have come to pass and no amount of "It would be worse if we weren't there" can make that better. This has been a massively blue budget, just like the PfG was a blue document. We in Labour should stop deluding ourselves to think we can curb the excesses of FG and actually implement any sort of progressive platform with our coalition "partners". I have avoided posting anything about the US election for all sorts of reasons. The two main candidates are both awful, the soundbytes are nauseating, the jingoism is unbearable. But mainly I haven't cared that much because this election has pretty much been a foregone conclusion for the last 18 months. The Republicans spent all of 2011 and most of 2012 tearing strips off each other in the attempt to pick a candidate. They ended up with Romney who ended up taking most of the flak in the endless GOP debates. But given the opposition, especially Cain, Bachmann, Gingrich and Perry, that came as no surprise. On the other side you had a slew of big name Democrats clearly declaring they weren't even going to challenge Obama in the primaries. So it should come as no surprise, as polling stations open in the US, that Obama is being given somewhere around an 80-85% chance of being re-elected. The crazies in the GOP be they Tea Partiers, Birthers, Religious Right, Creationists and what not have alienated many potential centre-right voters who will either stay at home or vote Obama. The other key thing to note is the inherent bias in the electoral college system towards the Democrats. The winner takes all system provides a huge head start to Obama in guaranteeing him New York, California and Illinois of the big states (104 votes already) whereas apart from Texas (38 votes) all the guaranteed Red states are pretty small in electoral college votes. The New York Times has a great visualization of just how difficult it is for Romney to win even with 9 swing states in play. So four more years of Obama. Well it's better than four years of Romney but then what wouldn't be better than a Romney presidency? I guess we can look forward to a few less wars, a few more rights for women and the gay community. But the US is still going to remain a very divided country both along the Red/Blue divide and the 1%/99% divide. Maybe in 2016 when we get a Hilary Clinton v Chris Christie or Marco Rubio contest we might actually have something to watch. Tonight I'll definitely be going to bed early. I was recently watching an old episodes of Yes, Prime Minister where the topic of local government reform came up. Hacker initially thinks that it is a great idea, Sir Humphrey obviously takes the opposite point of view. Add a militant socialist councillor and the usual confusion from Bernard and by the end of it Hacker is bamboozled into reversing his position. (Full recap here.). After today's announcement of Local Government reform by Phil Hogan, one has to wonder if a similar scene has played out over the last year or so in the Custom House. After years of neglect, cuts in funding, cuts in services and cuts in power held by locally elected representatives, local government in Ireland was prime for transformation. Similar to how Telecom Eireann skipped about 3 generations of technology in their modernisation in the late 80s and early 90s, we could have catapulted Ireland's local government regime to the top of the class. We could have skipped various failed models tried in other countries and built a best-of-breed system fit for the 21st Century - local issues being decided by local reps and paid for by locally raised taxes. Instead we see a continued assault on local democracy in the name of "savings". Sure we currently have too many county, borough and town councils for the activities that they are permitted to carry out. But is putting more and more of that power into the hands of unelected and unaccountable officials in the councils or the Department of Environment really a good idea? We have only recently seen the mess the officials have made of waste in Dublin with both the incinerator and the Greyhound privatization despite the countless votes against both actions by the elected representatives. One good proposal is the power for each local authority to set property taxes in their area. However, we still have to see if the property taxes raised will actually flow in full to the authority in which they are raised. I am still dubious that there won't be a transfer from urban to rural to ensure the continuation of a library in Clare or a fire service in Leitrim. Secondly, no timescale for this devolution has been given - this is a matter for government according to the Minister. But isn't he part of the government? Couldn't he have included a timetable in his major announcement today? On a practical note, when you exclude the town/borough councillors, the number of councillors will actually increase from 883 to 950. Assuming that there is some rebalancing of councillor numbers in line with population, it means that Dublin City Council is likely to increase in number from the current 52 to somewhere around 70 members, with similar increases in the other Dublin councils. From a very parochial point of view, it means the extended Dublin South East (sorry Bay South) is likely to now return 12 and so we could see the formation of two 6-seaters or three 4-seaters. So as one might imagine, the last week has been one of those glued to the coverage week as various storylines were picked up again after the long summer break in the political soap opera that is Ireland. The major plot twist is of course the resignation of Roisin Shortall from her role as junior minister in the Dept of Health. The truth of the matter is that the wrong minister has been forced out in this instance. James Reilly's shenanigans at getting some extra resources allocated to his constituency is exactly the sort of stuff we used to give out about with Fianna Fail and the Healy-Rae clan. What is even worse is his attempts to cover it up with bluster about Shortall's manipulation of the criteria for selection when the paperwork shows that this is patently false. But the real failing here is with the leadership of the Labour party. Gilmore and his handlers should have marched down to Hawkins House and gone though Reilly. They had the high moral ground here, had public support (except maybe in Dublin North), and most importantly they would have been in the right. Enda Kenny should have been given an ultimatum of Reilly or no coalition and given 12 hours to mull it over. And then they should have had the backbone to follow through. Instead, the wise heads in Ely Place decided to shaft one of our most able politicians for the sake of not upsetting Fine Gael. I would advise anyone who hasn't heard it yet to listen back to Shortall on the Marian Finucane show from this morning. She certainly doesn't hold back. Now we have Alex White promoted to the open slot in Health. While I am sure he'll do fine, he was actually a very good chair of the Finance Committee and will most likely have to give up leading the Labour delegation on the constitutional convention. We might have been best served leaving him where he was. The one bright light of the last week was today's successful pro-choice march through the streets of Dublin. Despite some well known commentators saying there were less than 30(!) people there, I estimated about 2000 or so marchers, with the organizers claiming 5000. Hopefully this can be the start of a real campaign to get legislation passed on X and ABC before moving on to a more liberal abortion regime not wrapped up in false claims around mother's health. Congratulations are due to Sinead Redmond and the rest of the pro-choice activists. The ball is now firmly in Ivana Bacik's court once the expert report is released some time in the very near future. Confucius never had it so right - it is a curse to live in interesting times.